Uravan is an atomic-era ghost town, named after the uranium and vanadium ores that were processed there for most of the 20th century. It is located in the Paradox Valley about 90 miles south of Grand Junction and 70 miles northwest of Telluride. A radium recovery plant began operation in 1912, using carnotite ore from nearby mines, and the Uravan area provided half of the world’s supply of radium between 1910 and 1922 as work by Marie Curie and others led to the use of the radioactive element to treat cancer. Radium was worth $120,000 a gram. The operation declined after 1923, however, because it was cheaper to process high-grade pitchblend ore from the Belgian Congo than the lower-grade carnotite ore from Colorado. The plant was purchased by the U.S. Vanadium Corp. and expanded in 1935 to process vanadium to serve demand for the element to harden steel. Uranium was found with vanadium but was considered a worthless byproduct at the time and was left in the mill’s tailings. The town of Uravan was established in 1936 by the mill’s owner to house its workers and their families, and it grew to about 800 residents. During World War II, U.S. Vanadium was hired by the Manhattan Project to process vanadium mill tailings to isolate uranium oxide, though the effort was disguised as vanadium processing and the word “uranium” was banned from official reports to maintain the secrecy of atomic bomb development. 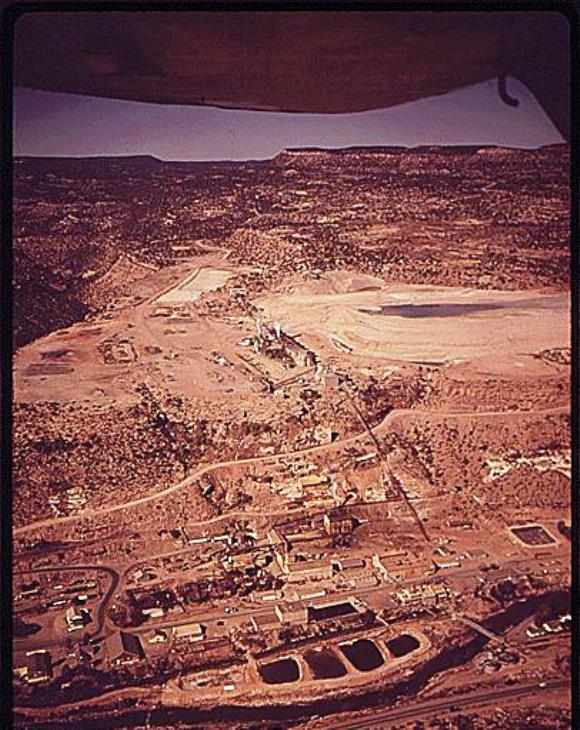 The plant began operating publicly as a uranium processing facility during the uranium boom of the 1950s as the federal Atomic Energy Commission boosted the price of uranium for use in nuclear power plants. Miners flocked to the Colorado-Utah borderlands in search of “yellowcake,” and the Uravan mill employed 4,000 workers and served 900 mines scattered across the Colorado-Utah borderlands. The mill processed more than 10 million tons of uranium-vanadium ore from the 1920s until it was shut down in the 1980s, according to a report from the federal Environmental Protection Agency. In those years, it produced more than 10 million tons of radioactive tailings and 38 million gallons of waste liquid residue, along with other milling wastes containing radioactive materials and heavy metals. The state took legal action in 1983 to get the mill and town cleaned up as a federal Superfund site, and Union Carbide and the Dow Chemical Co. subsidiary Umetco, which had operated the facility at different times, were determined to be the responsible parties. The town was closed at the end of 1986, and the cleanup effort continued until 2004. The 20-year, $120 million cleanup removed contaminated soil from 400 acres, moved more than 3 million cubic yards of mill wastes and 70 million gallons of seepage to a secure repository on nearby Club Mesa, demolished and removed 50 mill buildings and more than 260 buildings in the town, and extracted 245 million gallons of contaminated liquids and 14,500 tons of inorganic compounds from ground water, the EPA reported. Today, the barren townsite is surrounded by barbed-wire fence with yellow signs warning of radiation and radioactive materials. All buildings from the mill and town were demolished and removed. There is a turnoff and interpretive sign on Colorado 141. County: Montrose (Montrose is county seat). Altitude: 4,990 feet above sea level.